the hub of hoosier hospitality... Welcome to the Hampton Inn Evansville/Airport IN. Experience a place that offers all the fun of a big city in a local relaxed Midwestern atmosphere. At the Hampton Inn Evansville hotel you*ll be close to the Evansville Regional Airport and minutes away from all that Indiana*s third-largest city has to offer. Located in the metropolitan hub of the Illinois-Indiana-Kentucky Tri-State Area our Evansville IN hotel is ideal for business travelers. You*ll be close to Accuride Atlas Van Lines Berry Plastics Mead Johnson Old National Bank Shoe Carnival Vectren Springleaf Financial Services Toyota and more. We*re also home to the University of Evansville and the University of Southern Indiana. When it comes time for fun head to Mesker Park Zoo - Botanic Garden home to AMAZONIA Forest of Riches. Other attractions include the Koch Family Children*s Museum Burdette Park and Aquatic Center Casino Aztar the Angel Mounds State Historic Site Evansville African American Museum LST 325 World War II Warship Ellis Park Race Track and the Evansville Museum of Arts History - Science just to name a few. 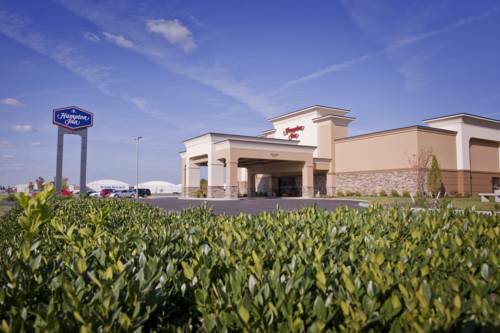 Visit our Hampton Inn Evansville Indiana hotel and discover the hub of Hoosier hospitality. Reservations must be cancelled by 11:59 PM the night before arrival local hotel time to avoid a penalty of one night room and tax charge. Note- Individual plans may vary. Please read individual display for more information. Policy subject to change. One of many outdoor displays of fiberglass animals at the Hipp Nursery.